This is the debut, self-titled CD from the Barlow Girls - Becca, Alyssa and Lauren Barlow. Produced in 2003 this album stirs up the male-dominated rock world with hit songs like 'Mirror' and 'Never Alone' - the number one song that earned the trio numerous 2004 GMA (Gospel Music Association) nominations, including Best New Artist and Best Rock Song and Album. 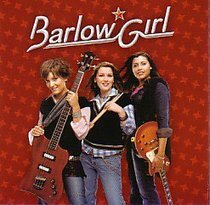 Not only do the Barlow sisters know how to rock, but the messages in their lyrics are based on strong Christian values including modesty and purity.